On 10 December 2015, at the residence in Chisty Side Street, His Holiness Patriarch Kirill of Moscow and All Russia received H.E. Tikahito Harada, Ambassador Extraordinary and Plenipotentiary of Japan to the Russian Federation, who is completing his diplomatic service in Moscow. Greeting the guest, the Primate of the Russian Orthodox Church mentioned their first meeting which took place in 2011, when Mr. Harada began his service as Japan’s Ambassador to Russia. His Holiness Patriarch Kirill noted the contribution that the head of Japan’s diplomatic corps had made to the promotion of good relations between the two countries in humanitarian sphere and the contacts between the Russian Orthodox Church and the Japanese Autonomous Orthodox Church, as well as his assistance in preparing the Patriarchal visit to Japan in 2012. As His Holiness Patriarch Kirill pointed out, his meeting with Japan’s Emperor Akihito was an event of particular importance. “His Majesty told me that one of the architects of the Imperial Palace had been an Orthodox Christian, the Japanese who had been baptized by Archbishop Nicholas,” His Holiness said. The Primate of the Russian Church warmly greeted Mrs. Atsuko Harada, the Ambassador’s spouse. Mrs. Harada is a granddaughter of Olga Hirayama who was brought up by St Nicholas of Japan, Equal-to-the-Apostles, and taught at a seminary for women, founded by Archbishop Nicholas in Tokyo. Mr. Tikahito Harada said in response that His Holiness Patriarch Kirill’s visit to Japan had become one of the most memorable events during his diplomatic service in Russia. “Not only I, but all people in Japan should not forget that during your visit to our country you visited the areas affected by the catastrophe of 2011, the earthquake and tsunami,” he said. “As you have mentioned, relations between countries are not always flourishing. Your visit to Japan made a considerable contribution to the deepening of mutual understanding and the development of friendly ties between our two counties,” the diplomat said in conclusion. Among those who took part in the meeting were also archpriest Nikolai Balashov, vice-chairman of the Moscow Patriarchate’s Department for External Church Relations, Mr. Dmitry Petrovsky, a staff member of the DECR Secretariat for Inter-Orthodox Relations, and Mr. Sigeno Fumi, Second Secretary of Japan’s Embassy in Russia. The Russian Orthodox Church duly appreciated Mr. Harada’s work. In 2012, Metropolitan Hilarion of Volokolamsk, DECR chairman, presented him with a Patriarchal award, Order of St Nicholas of Japan, Equal-to-the-Apostles (3rd class). 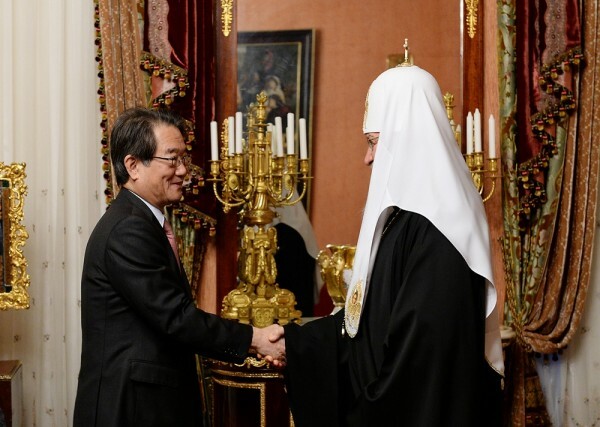 Tikahito Harada is the only Japan’s Ambassador who received an award of the Russian Orthodox Church.